When SonicWall released Capture ATP, it was the industry’s first multi-engine sandbox that could block files at the gateway until a verdict. The multi-engine design answered the need to detect and stop evasive malware. Capture ATP was designed to process unknown files in isolated parallel environments to see what suspicious code intends to do, from the application, to the OS and down to the software that resides on the hardware. Recently, SonicWall announced a new engine for Capture ATP called Real-Time Deep Memory Inspection (RTDMI) to improve the technology’s security effectiveness. Invented and developed by SonicWall’s Capture Labs threat researchers, patent-pending RTDMI engine already had been running in the background of Capture ATP service for months beforehand, dynamically selflearning and self-enhancing. 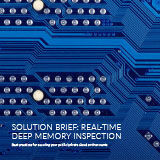 SonicWall Real-Time Deep Memory Inspection (RTDMI™) technology enables SonicWall Capture Advanced Threat Protection (ATP) to catch more malware faster than behaviorbased sandboxing methods, with a lower false positive rate.